Our lightweight brown Eco Kraft Paper will help add that extra pop in your food service design. Our personalized custom wrapping paper is the perfect way to bring your business’s brand to your customers. This printed Kraft paper sheet is great for lightweight food service duty, like basket liners and sandwich wraps. Our custom printed Eco Kraft Paper is sure to be a hit with your environmentally conscience customers. Go Green with our green wrapping paper! Eco Kraft paper that’s ready for multi use food wrapping plus more. Awesome natural Kraft paper look and feel! Perfect basket liner and lightweight food wrap for any occasion! Eco Kraft Paper is an easy and cost effective way to brand your image! Can I really order custom printed food wraps without having to own a warehouse to store it? Absolutely! Our custom printed Eco Kraft Paper has a 1 case minimum = 5,000 sheets, OR 3 rolls = 3,000 feet (1,000 feet per roll). Our ability to deliver short run orders of custom printed Eco Kraft Paper will eliminate your need for significant storage space, reduce your out of pocket expenses, and let you make the best impression possible to your customers. 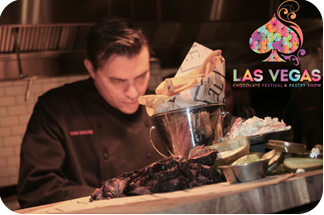 How can your lead time be 6 to 8 weeks when the competition is 10-12 weeks? Because they are slow and inefficient! Our goal is to get you your printed order as quickly as possible. We work tirelessly to make sure our customer deadlines are met. The quality of our product will keep you coming back for more. If you need your order in a hurry, ask one of our sales team members about our rush order program. Am I restricted to a small list of standard sheet sizes when ordering Kraft paper? No! While we do offer a list of standard Kraft paper sheet sizes to help keep your overall project costs down, we can also custom cut your sheet size to any desired width and length needed to fit your application. 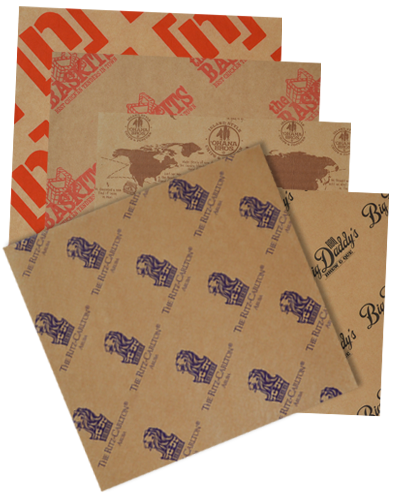 Is four-color process printing available for Kraft paper food wraps and liners? We are limited to 2 spot PMS colors on all our short run food service sheets. Sometimes, we have the ability to add 1 or 2 screens to your print if the colors in your logo allow us to use them. Three & four color prints are available for most of our food service paper line, but the minimums and capabilities are different than our short run food paper program. Contact our sales staff for more information. How creative can I get with my Kraft paper artwork? We’d like to think the sky is the limit, but unfortunately it’s not in this case. Short run Kraft paper orders are limited to a basic step and repeat pattern of one or more logos or a full page pattern design that is step and repeated down the roll before cutting. Our talented art department will work closely with you to come up with a creative solution to any problem. Need a price quote on custom printed Eco Kraft Paper? Contact us today! Looking for the next level up in eco-friendly food service paper? Check out our custom printed Natural Kraft Paper. This heavyweight uncoated Kraft sheet is very strong and versatile.